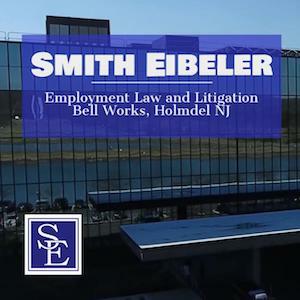 Robert W. Smith and Christopher J. Eibeler formed Smith Eibeler, LLC in 2011 to serve New Jersey employees, individuals and small businesses in a wide range of employment law issues and business litigation. Mr. Smith and Mr. Eibeler worked together in a prior law firm in which they successfully litigated employment related cases in the areas of sexual harassment, employment discrimination, whistleblower retaliation, Family Medical Leave Act (“FMLA”) and wrongful termination. Our law office was originally located in Shrewsbury, New Jersey at the Avenue of the Commons corporate complex located off Route 35. In 2016, we moved our law office to the new Bell Works complex in Holmdel, New Jersey, which is conveniently located off Exit 114 of the Garden State Parkway. We are proud to be one of the first companies to move to the Bell Works complex and become part of the corporate community of businesses at Bell Works. As a Monmouth County law firm, we pride ourselves on providing our clients with big firm quality representation in a small firm environment. An employment or commercial litigation case will inherently involve some complex legal issues that will require the employment or commercial lawyer and their client to develop and implement a strategic litigation plan. The Smith Eibeler Monmouth County employment litigators and our litigation staff will work with all our clients to develop a strategic litigation plan that is specifically designed for the needs of the case in order to achieve the best possible outcome, whether it be a settlement or trying the case before a jury in a court of law. We make sure that we maintain a free flow of communication with all our clients. Our Monmouth county employment attorneys are always available to speak to our clients and answers any questions or concerns they may have about their lawsuit. We fully understand that the filing of a lawsuit against a former employer or commercial business can be an extremely stressful and complicated endeavor and strive to minimize the inevitable stresses to our clients by always being available to them. Maintaining a constant flow of open communication with our clients is imperative in obtaining the best results possible for the case. Our New Jersey employment lawyers and business litigators practice throughout the state of New Jersey. Our law office is conveniently in Monmouth County, New Jersey at the Bell Works building in Holmdel, New Jersey less than one mile off Exit 114 of the Garden State Parkway. To learn more about how we can help you, please call our law office at Bell Works, Holmdel (732) 935-7246.